Our custom sheet metal work is renowned throughout the Western New York area for its durability and attention to detail. If you have a custom job and you aren't quite sure where to turn to, give COMFORT ZONE a call. We're happy to provide an estimate so that you can continue to shop around. We're confident that, once you see the high quality work you'll get for such a fair rate, you'll come back to us for all of your custom sheet metal work. 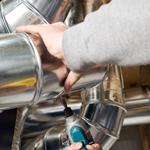 Our experienced craftsmen build the full range of HVAC applications in the company's own sheet metal shop. Steve Baldwin (owner of COMFORT ZONE) completed 4 years of Apprenticeship Training in the state of NY, becoming a Certified Sheet Metal Worker in 1994. We have extensive experience in all types of sheet metal work. Customized sheet metal products, such as chimney caps, storage boxes, truck roll bars.